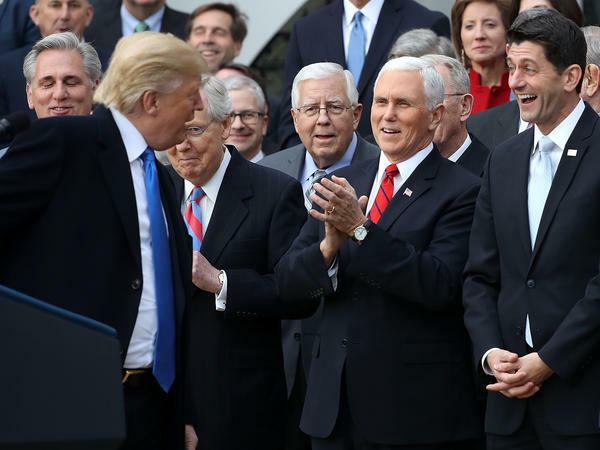 Donald Trump celebrates the passage of the Tax Cuts and Jobs Act. 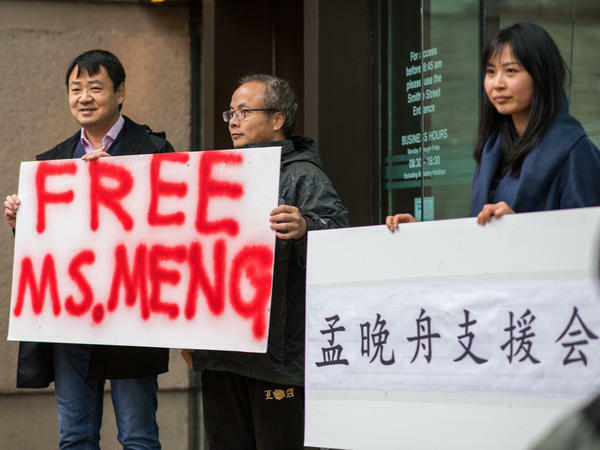 Meng Wanzhou's arrest has caused an uproar. Note: The trend was calculated by the CEA. 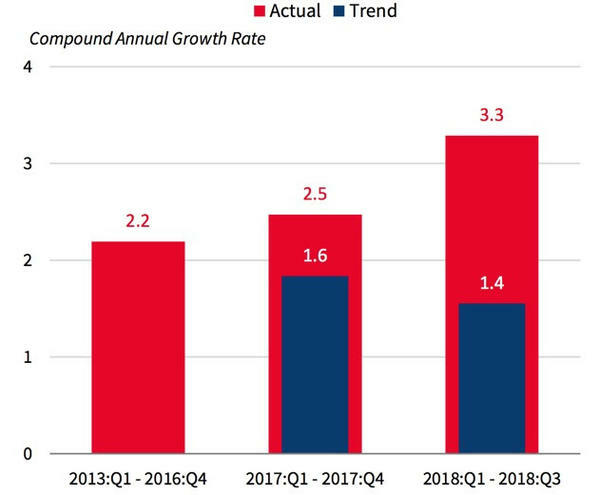 All values represent the compound annual growth rate over the given quarters. Donald Trump's most important economic policy turns a year old this week. If the Tax Cuts and Jobs Act (TCJA) were a baby, it still wouldn't be able to talk. But its personality is beginning to show, and there's a big debate over whether it's a problem child. Democrats hated the TCJA from the start. They called it a scandalous windfall for the rich during a time of historic inequality; a massive burden for the federal budget; and a stimulus when the country didn't need one. But Kevin Hassett, the current chairman of the Council of Economic Advisers, has spent the last year arguing that the centerpiece of the law — cutting the corporate tax rate from 35 percent to 21 percent — was much more than a stimulus. He's been predicting this tax cut will spark an investment boom that will raise wages and make America's economy stronger over the long haul. "The U.S. had the highest corporate tax rate in the developed world and it was driving companies overseas to low-tax jurisdictions such as Ireland," says Hassett. "It was something we had to do." Hassett maintains that a lower corporate tax rate will push companies to invest in things like new factories, machines and technology. That, in theory, should make workers more productive and wages go up. And raising wages, Hassett argues, was a central reason we needed tax reform. Before the tax law was signed into law by President Trump on December 22, 2017, Hassett predicted that pay for the average American household would increase by at least $4,000 within three to five years. That's still two to four years away, so we won't know about long-term pay raises yet. But Hassett says there's already good news: Annual disposable income for the average American household is already up $2,100 since the law passed. Jason Furman, former chairman of the Council of Economic Advisers under President Barack Obama, says income is up because taxes are lower, but it's not real wage growth. The cuts (and a big increase in military spending) injected more than a trillion dollars into the economy. With all that money sloshing around, it's not surprising to see faster growth. Detractors have been calling this growth a "sugar high," a short-term burst of excitement before a headache. "This is 'high-protein' economic growth, not a 'sugar high,'" says Hassett, citing what he believes to be an investment boom that will provide the nutrients for a stronger economy over the long run. "Thus far in 2018, investment as a share of GDP is on track to hit its second highest level for any calendar year since 2001." But is there really an investment boom? Of course, we don't know what the U.S. economy looks like without the tax law. And there are a gazillion other factors currently affecting it, including the Fed raising interest rates and Trump's escalating trade war. But the investment boom — the foundation of the administration's argument that the tax cuts will help working folks — may have been more of a blip than a boom. Jason Furman, Obama's former economic adviser, thinks the picture is even worse than outlined above. He says the uptick of business investment in the first six months of 2018 was mostly the result of oil and gas spending that followed the rebound of energy prices, not the tax cut. The tax cut has increased the annual deficit substantially. Despite a growing economy, the deficit grew by about 17 percent since last year. The nonpartisan Congressional Budget Office estimates the law will cost the government almost $2 trillion over the next decade. That's a lot of money for a law that might not be delivering the investment it promised.